45 minutes north of its more famous neighbor Coeur d’Alene, this town on Idaho’s largest lake offers equally beautiful scenery and fewer crowds. 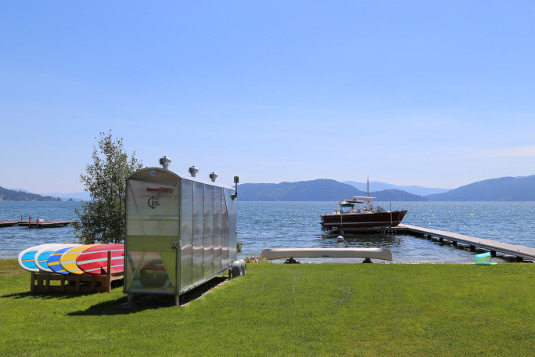 Each summer, my family spends two weeks in Sandpoint, a town on Lake Pend Oreille in the Idaho Panhandle. I’ve done my fair share of traveling and I think this is one of the most beautiful places on earth. The sparkling blue-green lake is backed by the impressive Selkirk mountains. It’s heaven for outdoor enthusiasts. In the summer, there’s hiking, biking, horseback riding and boating. In the winter, there’s skiing on Mount Schweitzer. Sandpoint’s charming downtown offers locally-owned coffee shops, breweries and wine bars. Apparently, the word is getting out–Matthew McConaughey bought an island on the lake. A perfect day on Lake Pend Oreille. Lake Pend Oreille is the largest lake in Idaho. It’s 43 miles long and 1,150 feet deep (making it the fifth deepest lake in the United States). City Beach, next to downtown, is a public park and beach that offers a nice protected place to swim and beautiful panoramic views of the lake. For boat rentals check out Hope Marina or Action Water Sports. A lazy morning at my parent’s house on Lake Pend Oreille in Northern Idaho. Here are my recommendations for where to eat and drink and what to do in Sandpoint. The food at this downtown bistro with red brick walls and wooden tables is quite good if a little random. Diners will find everything from a Maine lobster roll to a pear and Brie cheese bruschetta. Reliable options include the portobello mushroom burger and the key lime pie. Pend d’Oreille winery offers a variety of wines from Albariño to Cabernet Sauvignon. Sandpoint is home to an excellent working winery. 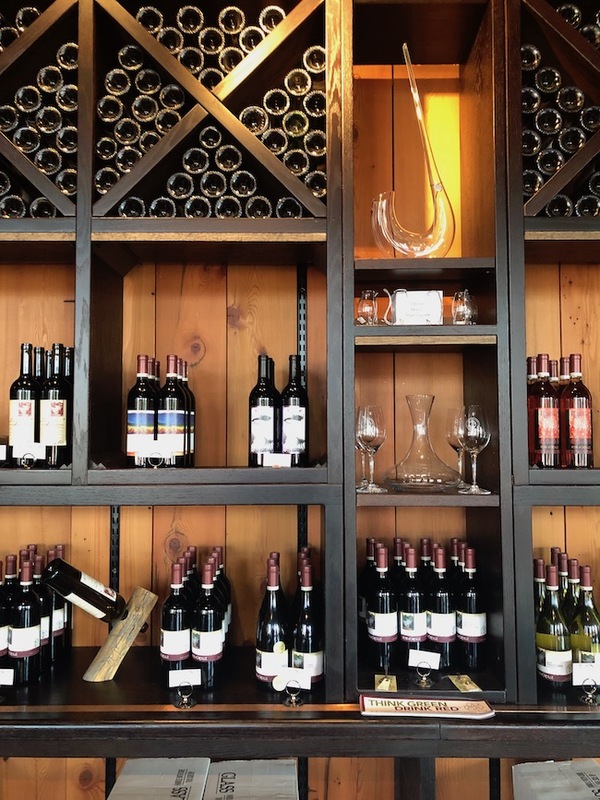 Located in the historic Belwood Building, Pend d’Oreille Winery produces award-winning wines made with grapes sourced from throughout the Northwest like Reserve Chardonnay, robust Cabernet Sauvignon and a smooth and earthy Syrah. Head winemaker Jim Bopp trained in France. The patio of Fat Pig, a restaurant in the historic Belwood Building in Sandpoint, Idaho. The adjoining Fat Pig restaurant serves a meat-centric menu featuring duck tacos and a burger with muenster cheese. Pend d’Oreille winery has live music on Friday nights and sometimes during the week. The Foster’s Crossing Antique & Country Market. 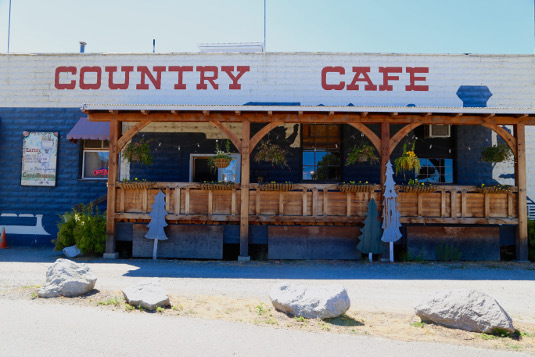 One of my family’s favorite lunch spots in Sandpoint is inside the Foster’s Crossing Antique & Country Market. Café Bodega serves salads and sandwiches like a muffuletta with salami, prosciutto, Swiss cheese, and olive salad. Seating is at communal farm tables. 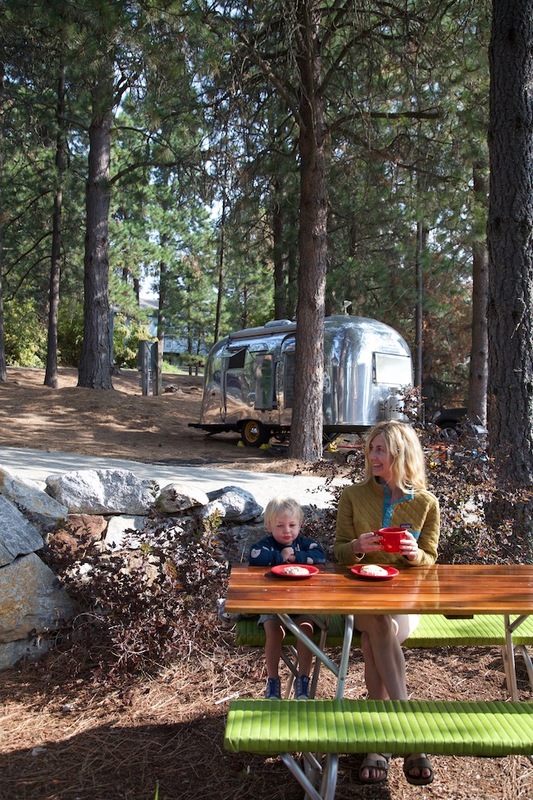 Afterward, you can browse the antique shops for vintage camping gear and art. Dish at Dover Bay Cafe offers a nice outdoor patio overlooking the lake. Expect comfort food like buffalo meatloaf and brisket with mac and cheese as well as lighter fare like fish tacos. Dish has brunch on weekends. This dive bar and live music venue is a good choice if you want simple pub fare. Think elk burgers with a side of garlic and parsley French fries. Evan’s Brothers is located in an industrial warehouse. I think this airy espresso bar with roll-up doors serves the best coffee in Sandpoint. Single origin and estate coffee beans are roasted on site. The café has local art, free wifi and some food like organic breakfast burritos. Evan’s Brothers is located in downtown Sandpoint in the Granary Arts District. True to its name, this 35-year old restaurant sits on a floating dock in the Hope Marina. If you have a boat, make a night of it by boating to dinner (it takes about 30 or 40 minutes to get there from Sandpoint on the water). Plenty of slips are reserved for dinner guests. If you’d rather drive, that’s just fine too. The best tables are definitely on the patio with views of the lake and Schweitzer Basin. Dishes are a tad decadent and include buffalo Burgundy stew with crème fresh and lobster ravioli with wild prawns. Reservations are recommended. This gourmet food shop is worth the drive up to Mount Schweitzer, the local ski mountain, for cheese and charcuterie, salmon BLT sandwiches and an excellent wine selection. If you want something slightly more formal in downtown Sandpoint, Ivano’s is probably your best bet. The Italian restaurant, a staple in Sandpoint since 1984, serves dishes such as shrimp scampi and pork Osso Bucco. Reservations are probably wise on busy summer weekends. Ivano’s also has a second location that opens during the summer in Beyond Hope. It has a patio with spectacular views of the lake. I love Joel’s for a quick lunch. It’s also a great place for kids. Diners order at the counter and sit outside. I always order the salmon fish tacos, ceviche and bean tostadas. This funky restaurant is located on a brightly colored bus that is typically parked near Evan’s Brothers coffee shop. Dishes include tacos, sandwiches and arepas, a Venezuelan corn cake with black beans, chicken, and cilantro-lime dressing. This ice cream shop makes unique flavors like peppermint fudge, salted caramel with brown butter cookie and huckleberry buttermilk. It opens early on Saturday morning. Grab a coffee and a cinnamon roll before perusing the shops on First Ave.
What’s on tap at the Idaho Pour Authority. Opened since 2013, the Idaho Pour Authority stocks the best beers from around the West as well as some imports like Chimay. Enjoy beers on draft in the colorful space or take bottles to go. The bar also sells gourmet artisan food items like fine cheeses. Note that kids are not allowed. Just like every other city and town in the West these days, Sandpoint has great beer. Laughing Dog has been brewing craft beer since 2005. It has over 15 beers including IPAs, stouts and seasonal huckleberry ale. The Taproom is dog-friendly. 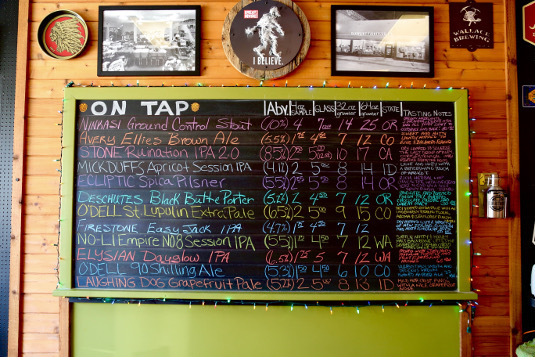 This brewery has both an Irish brewpub and a beer hall in downtown Sandpoint. 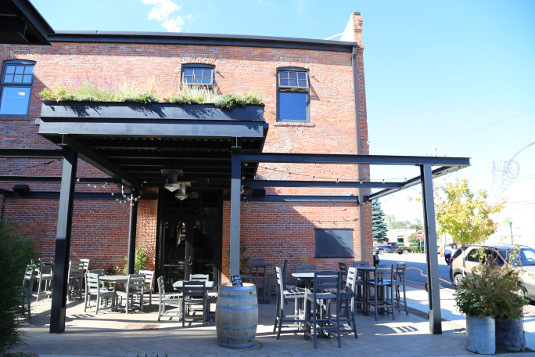 The brewpub on North First Ave. serves casual food like hamburgers and hand-cut Idaho French fries. 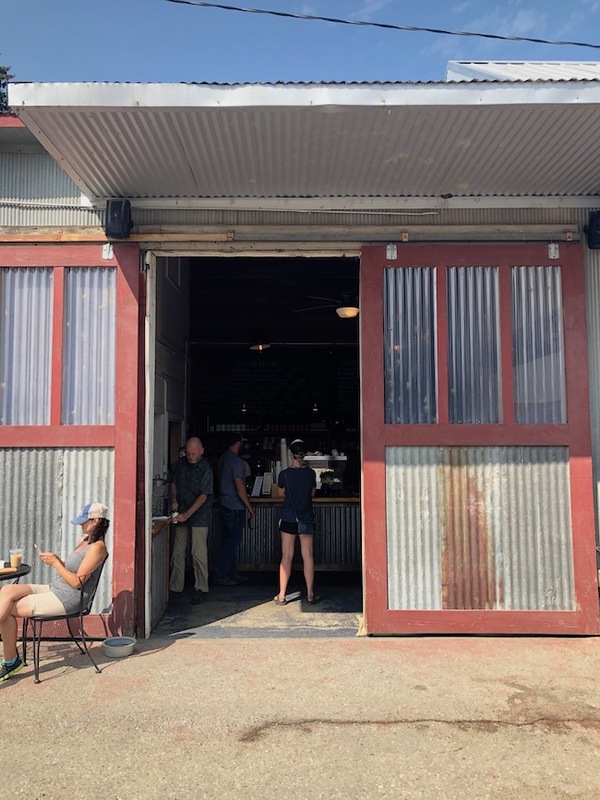 If you just want to toss back a pint, head to the beer hall on Cedar (you have to be 21 or older to go in) for a variety of beers on tap from light American Lager to Irish Red Ale as well as games and gourmet popcorn. This is our favorite grocery store in Sandpoint. It’s a Spokane based chain of grocery stores and stocks great fresh produce. It also has a natural foods section and a good selection of wine. This locally owned natural foods market is a great alternative to the larger grocery stores in town. It also has a deli, juice bar and espresso bar. 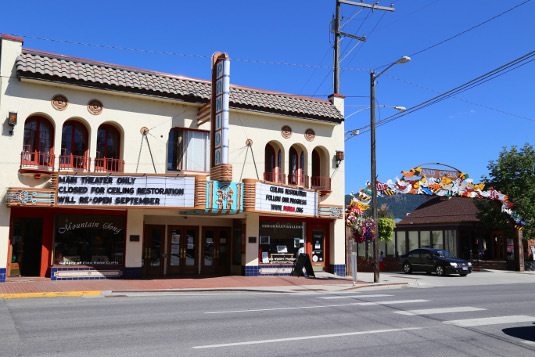 The historic Panida Theater in downtown Sandpoint. This is the best outdoor shop in Sandpoint. There are often great sales in the summer. This annual concert series takes place the first two weeks in August on Sandpoint’s Memorial Field. There are grandstands, but most people sit in the grass on blankets or low back chairs. What’s really amazing is outside food and drink (including alcohol) is allowed at every concert. The food stalls, all local restaurants, are great so you may want to plan on eating dinner there. For a full list of concerts and to purchase tickets click here. Concerts do sell out but you can usually scalp tickets outside. Located at Memorial Field on Ontario St. This is a great indoor live music venue in downtown Sandpoint featuring bands like Yonder Mountain String Band and Pimps of Joytime. The Hive typically holds a special lineup of concerts to coincide with the Festival. The Pend Oreille Arts Council’s annual art fair at Sandpoint City Beach takes place each August and includes artist booths, kids activities and live entertainment. For a challenging road ride, do the 9-mile climb up Schweitzer Mountain. The resort also has a Mountain Bike Park and Sandpoint has 9.5 miles of bike trails. Click here for a map. Read more about hiking and biking in Sandpoint here. For bike rentals check out Greasy Fingers. Classes ranging from Power Vinyasa to Buddhist Meditation are held daily. Check the class schedule here. Free community yoga is held Sunday mornings at 8 am. At Farmin Park in downtown Sandpoint, visitors will find a bountiful farmer’s market each Wednesday and Saturday. Vendors sell locally grown fruits and vegetables, baked goods and arts and crafts. It runs 3pm-5:30 pm Wednesdays and 9am-1pm Saturdays. Farmin Park- Third Ave. and Oak St. The Grouse Creek hike ends at a waterfall with natural waterslides. 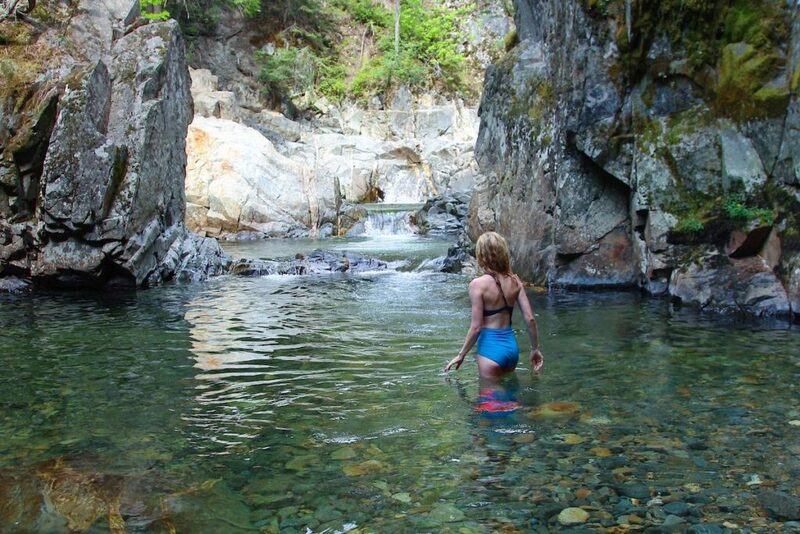 This easy hike to a waterfall/swimming hole is great for families. It’s just about a mile to get there. The water can be icy cold, but the natural waterslides are so much fun you may not mind. Driving directions: Go six miles east on Highway 200 from Sandpoint, then north onto Colburn-Culver Road. Drive six miles to the Grouse Creek Cut-Off Road on the right then about two miles to join Grouse Creek or Forest Service Road 280. Take a right and continue approximately four miles staying on Road 280. Watch for a small open meadow on the left. Just beyond the meadow on the right is an unmarked road going down a hill to trailhead #83. Have more travel plans in the Pacific Northwest. Check out this seafood-inspired road trip.